“Captain Marvel,” the first Marvel Studios/Disney superhero film with a female lead, has soared to rare heights in North American theaters, with whopping weekend ticket sales of $153 million, industry watcher Exhibitor Relations reported. Added to the $302 million taken in internationally, the film’s estimated total of $455 million for the three-day weekend would give it the sixth highest global debut ever, according to Variety, and the best domestic start for a superhero film since Disney and Marvel’s “Black Panther” opened last year with $202 million. 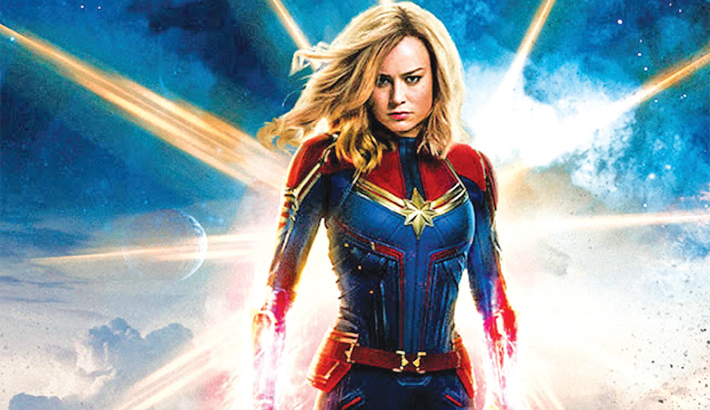 The film stars Brie Larson, winner of a 2016 Best Actress Oscar for “Room,” as Carol Danvers, a former fighter pilot who gains superhuman powers in a fluke accident and finds herself in the middle of a galactic conflict. Also starring are Samuel L. Jackson, Ben Mendelsohn, Djimon Hounsou, Annette Bening and Jude Law. The film, which opened on International Women’s Day, was co-directed by Anna Boden and Ryan Fleck. Trailing light-years behind in second place, at $14.7 million, was Universal’s “How to Train Your Dragon: The Hidden World,” which had topped the North American box office for two straight weekends. In third, down one spot, was Lionsgate’s “A Madea Family Funeral” from actor/director Tyler Perry.